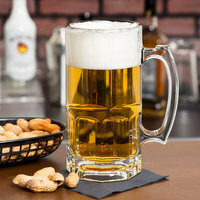 Serve the thirsty customers in your restaurant or bar their favorite brew on tap in a 1 liter beer mug! 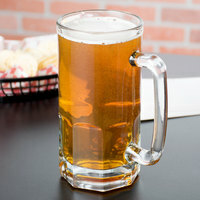 These mugs hold a larger portion of beer than a traditional pint glass, so you can satisfy patrons who want more to drink than a traditional pint glass offers. Best of all, these mugs can be used to serve other beverages, as well, including cider, root beer, lemonade, and frozen drinks! 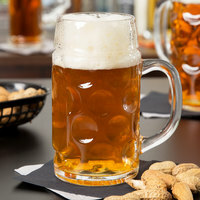 Each 1 liter beer mug features a thick, sturdy base and a durable construction that makes it perfect for use in any high-volume foodservice establishment. Choose from either glass mugs or plastic options that are safe for drink service in outdoor establishments. Their crystal clear constructions also give drinks enhanced visual appeal because they allow customers to clearly see the colors of their craft beers and their frothy heads.